Calibrachoa are spectacular little plants whose flowers resemble tiny petunias. The plants can survive year round in USDA plant zones 9 to 11, but in other regions they are treated as annuals. 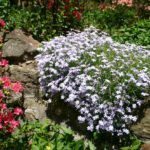 Gardeners who are in love with these trailing plants might wonder how to root Calibrachoa cuttings or what other methods of propagation are useful. These tiny darlings can grow from seed but cuttings of Calibrachoa are the primary method of propagation. It will take at least two months for cuttings to mature, so harvest them at the appropriate time. Calibrachoa plants were first collected wild in the late 1980s. They hail from South America and are also sold as million bells due to the many tiny blooms. There are numerous colors from which to choose as well as double petal varieties. Preserving your favorite is as simple as taking cuttings and providing certain cultural conditions. Calibrachoa cutting propagation is the method preferred by professional growers. While calibrachoa growers take cuttings in late winter in order to achieve sellable plants by spring, gardeners can take cuttings in spring for late summer plants. Take 6-inch (15 cm.) tip cuttings in the morning and insert the cut end into a good soilless potting medium that drains well. The cuttings will require high light in full sun and consistent misting to take off correctly. Other cultural considerations are also important to successful calibrachoa cutting propagation. Cuttings of calibrachoa respond to a consistently moist medium. Keeping the cutting from wilting is important, as the new plant will put its efforts to saving itself rather than rooting in low moisture settings. Use de-mineralized water to irrigate. This will prevent buildup of mineral salts. Avoid over misting the cuttings, as stem rot can occur. Place containers where temperatures are consistently 70 degrees Fahrenheit (21 C.) for the first two weeks. Thereafter, place plants in a slightly cooler location. Use a complete fertilizer once per week to promote leafy growth and root formation. The most common mistake is overwatering. Misting the medium will help prevent extra moisture from building up. So can using a small container, especially if it unglazed and can promote evaporation of excess water. Iron deficiencies are common in production. Add extra iron if plant leaves are slightly yellow. Use good sanitary practices to avoid transmitting any disease to the newly forming plants. Avoid higher heat during rooting. Leggy plants often form in high light situations. Pinch plants early before stems get woody for best results in forming compact plants. Rooting time will vary, but most plants will root within a month. Calibrachoa are quite easy to propagate with cuttings but it is best to start numerous cuttings for a better chance of success on at least a few.